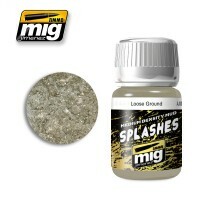 Hobby Shop - New range of enamel effects with different textures - dust, soil, mud, ready to be applied. New range of enamel effects with different textures - dust, soil, mud, ready to be applied. Light Tan textured dry soil effect perfect for realistic thick deposits of dry high density soil. Realistically adds the final touches of variable textured mud to your model. Apply with a brush or tool, manipulate or remove with a clean brush mo..
Yellow Brown textured dry soil effect can be used to create the accumulation of heavy summer soil. Realistically adds the final touches of variable textured mud to your model. Apply with a brush or tool, manipulate or remove with a clean brush m.. Thick Earth color enamel medium with varied texture. Useful for almost all subjects. Realistically adds the final touches of variable textured mud to your model. Apply with a brush or tool, manipulate or remove with a clean brush moist with thin.. Satin Damp Ground textured enamel medium for creating damp or wet high density ground. Realistically adds the final touches of variable textured mud to your model. Apply with a brush or tool, manipulate or remove with a clean brush moist with th.. Dark brown textured soil effect perfect for realistic thick deposits of high density soil. 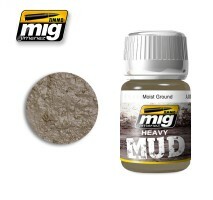 Realistically adds the final touches of variable textured mud to your model.Apply with a brush or tool, manipulate or remove with a clean brush moist with..
Fresh Wet Mud textured enamel medium realistically recreates surfaces with heavy mud accumulations. Realistically adds the final touches of variable textured mud to your model. Apply with a brush or tool, manipulate or remove with a clean brush moist..
Light Tan textured dry soil effect perfect for realistic touches of dry light colored medium density soil. Realistically creates the final touches of variable textured soil to your model. Apply with a brush or spatula tool, manipulate or remove with ..
Yellow Brown textured dry soil effect can be used to create the accumulation of medium density dry summer soil. Realistically adds the final touches of variable textured soil to your model. Apply with a brush or tool, manipulate or remove with a clea..
Earth color enamel medium with varied texture. Useful for almost all subjects. Realistically creates the final touches of variable medium textured earth to your model. Apply with a brush or tool, manipulate or remove with a clean brush moist with thi.. Satin Damp Ground textured enamel medium for creating medium density damp or wet ground. Realistically creates the final touches of variable textured ground to your model. Apply with a brush or tool, manipulate or remove with a clean brush mois.. 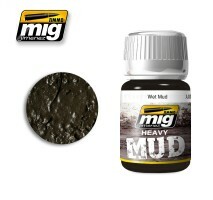 Dark Mud color textured enamel medium perfect for creating accumulations of medium density textured mud and earth. Realistically add the final touches of variable textured earth to your model. Apply with a brush or tool, manipulate or remove with a c..
Fresh Wet Ground textured enamel medium realistically recreates surfaces with medium density mud accumulations. Realistically add the final touches of variable textured mud to your model. Apply with a brush or tool, manipulate or remove with a clean ..